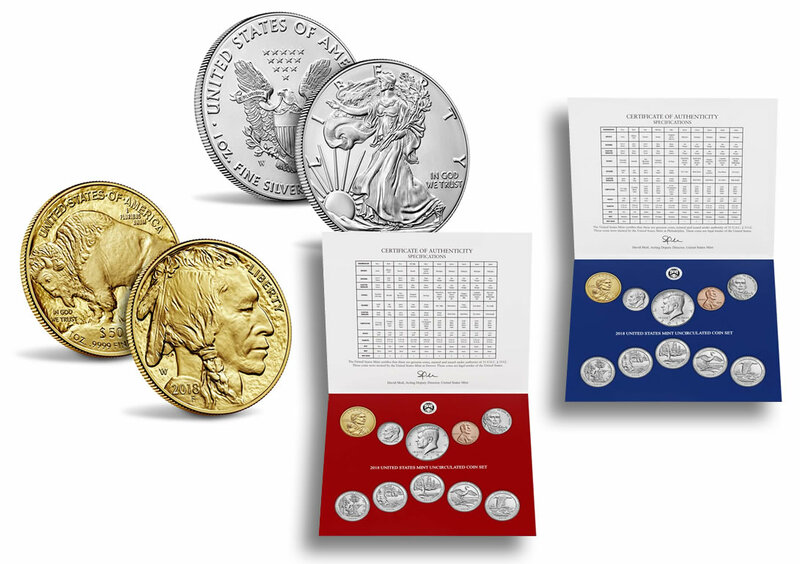 The month of May will be relatively quiet for the United States Mint with only three product releases — the proof American Gold Buffalo, the uncirculated Mint Set, and the uncirculated American Silver Eagle. All three are annually issued products for collectors. Two of them will score six-figure sales. A summary of the upcoming products are below. First up for the month is the West Point Mint’s .9999 proof American Buffalo 1-ounce gold coin with an on sale date of this Thursday, May 10. Its price can change every Wednesday based on the weekly average of LBMA gold. Today, it would be $1,710 based on gold’s position within the range of $1,300.00 to $1,349.99 an ounce. Last year’s coin ended with sales of 15,810. Available May 14 for $21.95, the Mint Set includes 20 uncirculated coins with a red folder of 10 coins from the Denver Mint and a blue folder of 10 coins from the Philadelphia Mint. These sets are popular with collectors. Last year’s set is $1 less and has current sales of 279,407. Another of the U.S. Mint’s more popular annual products, the 1-ounce .999 fine uncirculated American Silver Eagle from West Point, launches on May 24 for $46.95. Last year’s version was released on June 29, 2017 for $2 less. It logged early four-day sales of 111,224. Still available, it has sales of 144,180. Collector products launch at noon (ET) on the day of their release. Orders may then be placed through the U.S. Mint website at catalog.usmint.gov or by phone at 1-800-USA-MINT (872-6468). Aside from the annual subscription for the “Uncirculated Park Quarters,” I have not purchased anything from the US Mint since last year (Oct. 19, 2017). By the way, Mike, I like the new feature that allows us to “edit” in case of misspellings, etc. What?? The 2018 UNC ASE will sell for $2 more than the 2017?? So because sales of that coin were (are) very low, if they RAISE THE PRICE sales will increase?? ?